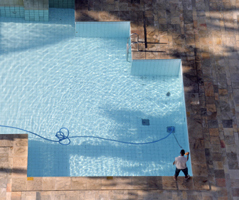 Whether you're looking to fulfill a job requirement, be in compliance with the Southern Nevada Health District (SNHD) requirements, or just looking to deepen your knowledge and skills in the pool industry, becoming a Certified Pool Operator (CPO) is the best way to learn the skills and get where you want to be in the industry. The National Swimming Pool Foundation (NSPF) has gathered the most up to date information on best practices in the industry to keep your pool equipment in top operating order and swimmers safe and healthy. As a CPO you will be equipt and positioned to handle all aspects of pool service such as water quality and adjustment, equipment calculations and operations, and facility management. Getting certified as a CPO is by far the best step you can take to further your understanding in swimming pool managment and service.